This reading is known as the Beatitudes. It is the prelude to the famous Sermon on the Mount, which continues for three chapters of Matthew. This reading sets the revolutionary tone of Jesus’s message. In a world in which stature is defined by strength, we are told to be meek. In a world that craves wealth, we are told to crave righteousness. In a world that idolizes warriors, we are told to be peacemakers. In a world that promotes jingoism, we are told to be children of God. This hexagram consists of the lower trigram Stillness and the upper trigram Word. These two trigrams are mirror images of each other. Stillness (lower) has two weak lines in the first and second positions and a strong line in the third position. Word (upper) has its two weak lines in the second and third positions and its strong line in the first position. 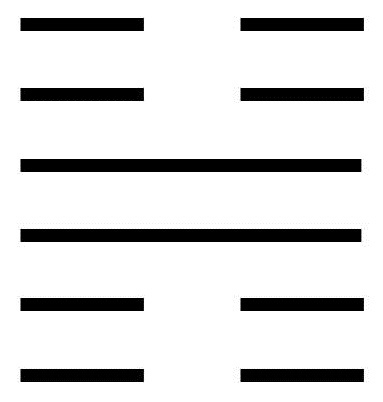 When these two trigrams are stacked, we end up with two weak lines in the bottom two and the top two positions. Sandwiched in between are the two strong lines. Looking at the hexagram from the outside world, we see only weak lines. But at the core of the hexagram is strength. This gives a sense of the archetype: strength held interiorly and weakness presented exteriorly. To be wary about holding authority when not ready. To cultivate humility, modesty, and conscientiousness combined with dignified personal behavior. To let go of grandiose goals that are driven by Ego and focus on small, meaningful achievements. To favor emotion over ceremony, simplicity over pretentiousness, and thrift over ostentatiousness. To remember that the smallest deeds of love can have a long-term impact. To maintain dignity in one’s behavior, even when doing so seems petty to others. To be in solidarity with those who are considered the lowly. A moving line in the bottom position warns that one should not run before one can walk. We should try simple solutions before we resort to complex solutions, lest we exhaust ourselves and accomplish nothing. A moving line in the second position offers guidance in dealing with unusual situations. The line suggests another approach to family relationships, one based on natural attractions rather than hierarchical expectations. The line also suggests that if one is faced with a decision that requires approval from a superior, one should seek that superior’s approval. If the approval is not forthcoming, then this is not the time to force one’s own will but rather to show restraint and fulfill one’s obligations. A moving line in the third position warns us that we need to be cautious. Ego may tell us that because we are right, we don’t need to be careful. But Ego is deluding us. The line tells us that there are dangers for which we are not yet prepared. This is the time to pay close attention to the smallest and seemingly least significant issues. A moving line in the fourth position warns that there is a great danger of making mistakes. The line suggests that we yield and make no attempt to reach our goals. Instead, the line suggests using this time to build interior strength and character. A moving line in the fifth position advises how to accomplish an important task. The line suggests that there is a leader who is well qualified to achieve the task but is unable to do so because of a lack of support. Helpers are needed who have proven their ability but have since retired. These helpers will need to be coaxed out of retirement. With these helpers, the line tells us the task will be completed. A moving line in the top position warns that there is danger of overstepping our bounds. This is not the time for big accomplishment, but for accomplishing seemingly small things. Thus, pushing on relentlessly to big goals will lead to failure.